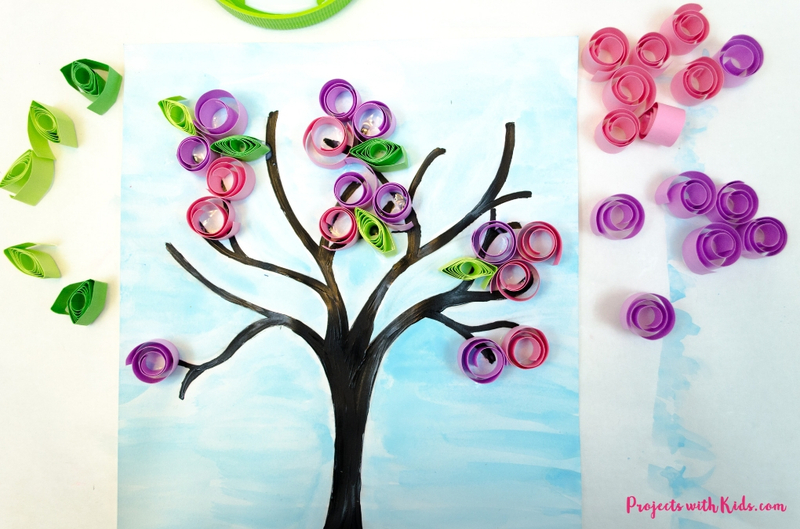 Celebrate all of the colorful blossom trees of the season with this gorgeous spring tree craft! I love this time of year when the cherry blossom trees start to bloom, it creates such beautiful and vibrant colors everywhere. We also have magnolia trees and pretty dogwood trees in our area. 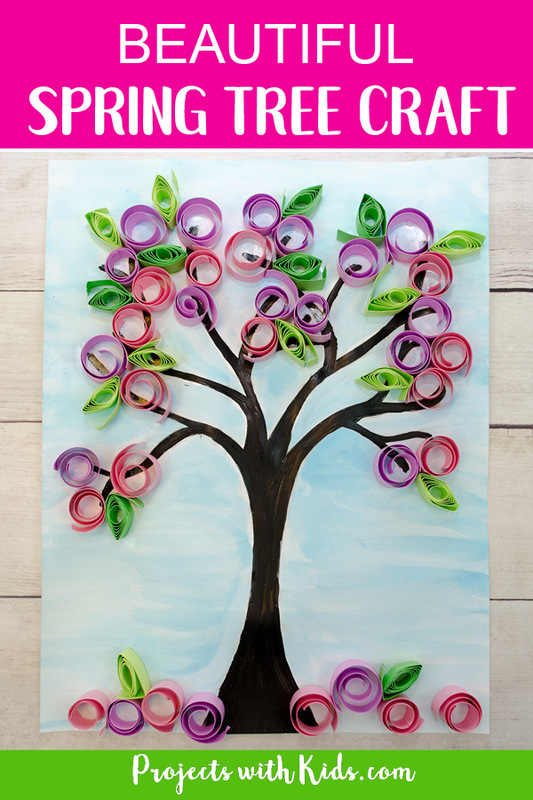 This is a great craft for kids to make to welcome spring and talk about the change of seasons. Making the paper quills also makes a great fine motor activity. 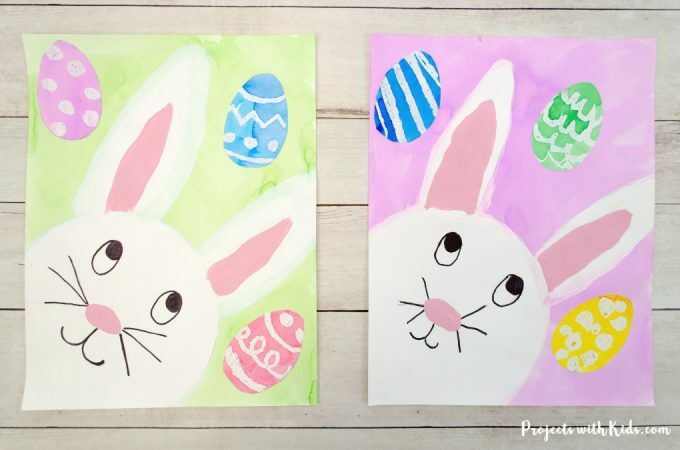 Kids of all ages will love creating this beautiful spring artwork! 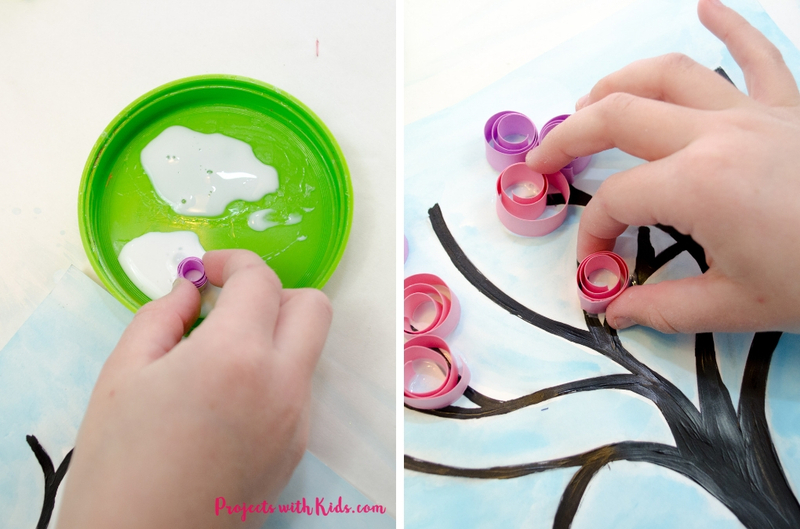 Take a look at our cherry blossom painting where we used cotton balls to paint the blossoms. For this project, I created a printable to make this craft even easier for you (and is great for younger kids!). This template is available to my email subscribers as part of my free printable resource library. Sign up to my email list below to gain instant access. 1. 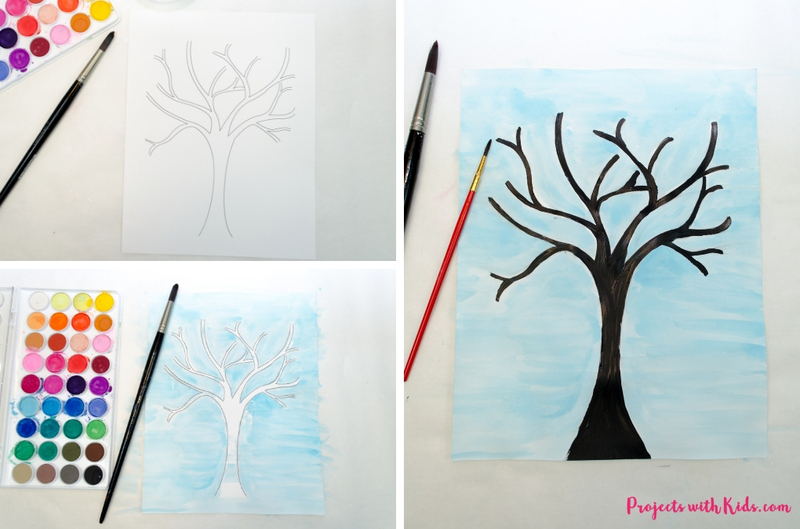 Print out the tree template from my resource library onto white cardstock. Scroll down to sign up to my newsletter and gain access. 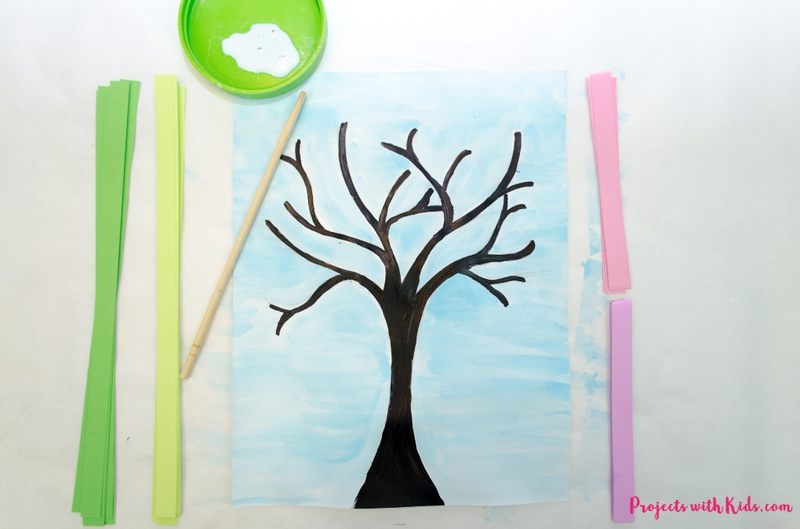 Older kids might want to try drawing their own tree. 2. 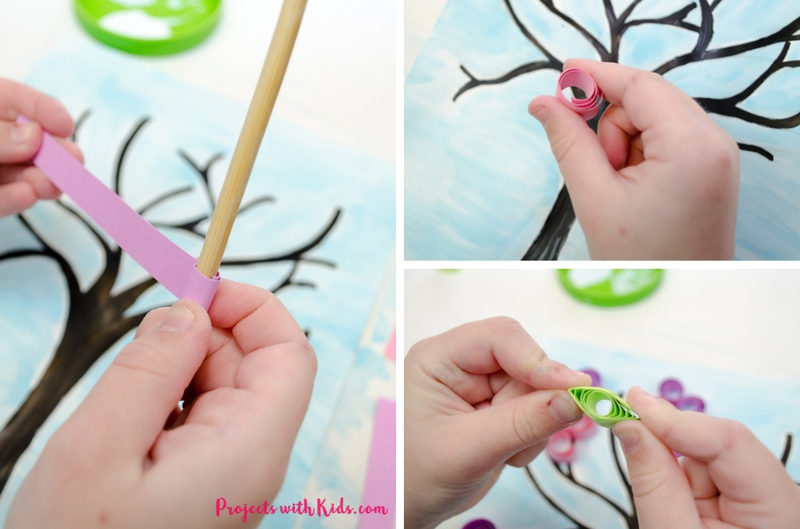 Cut out your paper strips using cardstock or construction paper. We used pink and purple for the blossoms and 2 shades of green for the leaves. I cut our paper strips to 1/2 inch thick with a paper cutter. For the blossom colors, I cut the paper in half to make the strips shorter which I think makes a nicer blossom size. 3. Using watercolor paint, paint the sky with a light blue color. You might notice that the ink from the tree smudges when painted over if this happens simply paint around the tree like in the example above. Let the sky dry completely. 4. Next, paint the tree black. We used black acrylic paint for this but you could also use black watercolor paint. If you use watercolors to paint the tree, it won’t be as dark as using acrylics. 5. 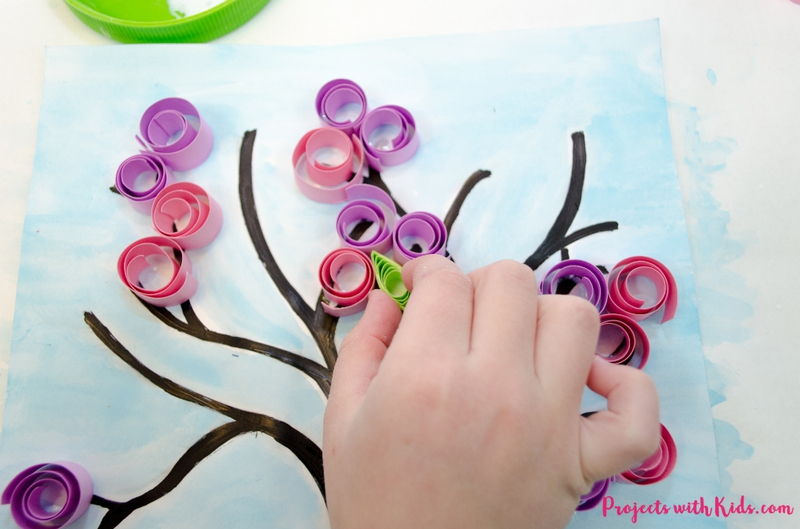 While you are waiting for the tree to dry, kids can start to make their paper coils. 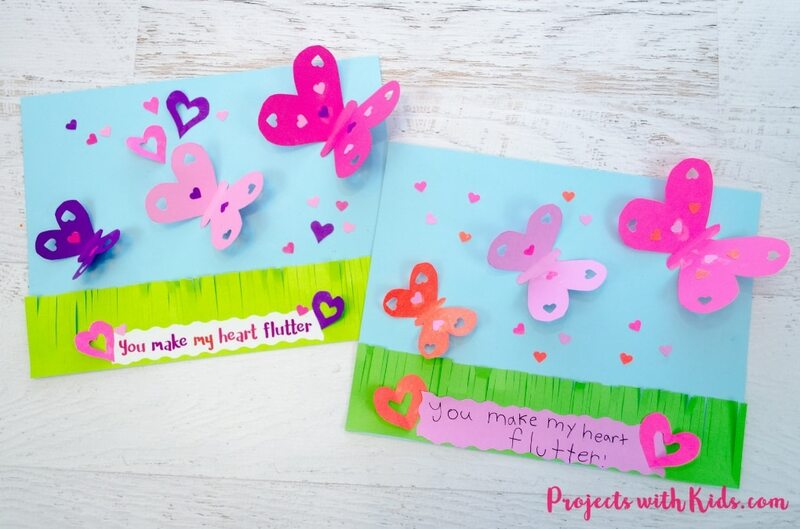 Kids can make their paper quills first and then glue them down or make them one by one and glue down as they go. There are 2 different paper quill shapes that we used for this project. One is just a basic coil shape and the other is a leaf shape. To make the coil shape, wrap a paper strip around a chopstick or pencil, I like the size of the coils when wrapped around a round chopstick the best. You could also experiment with using a bamboo skewer. Wrap the paper strip all the way around your chopstick or pencil and slide it off, don’t worry about the coil unwrapping a bit, it just adds to the design. To make the leaf shape, simply pinch your coil shape at both ends like in the example above. 6. 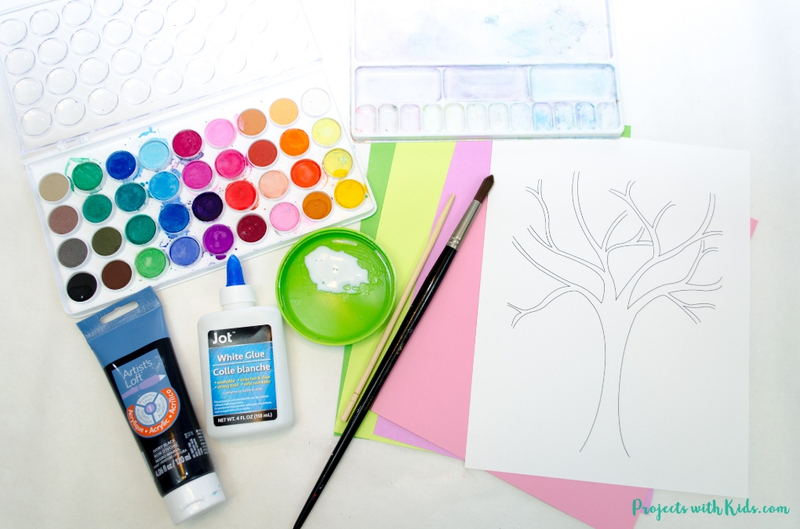 Dip a paper quill into a small dish of white glue and glue it to the tree. 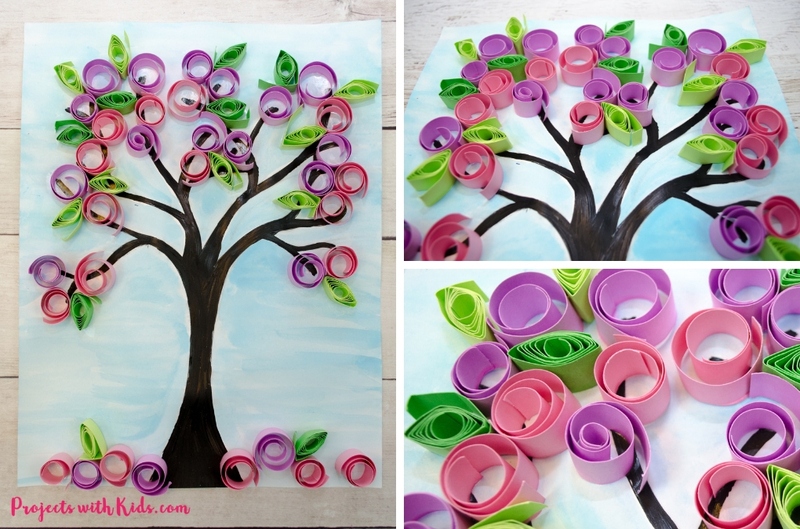 Keep gluing down your blossom and leaf shapes until you are finished. We also added some paper quills to the bottom of the tree, which I think looks nice. 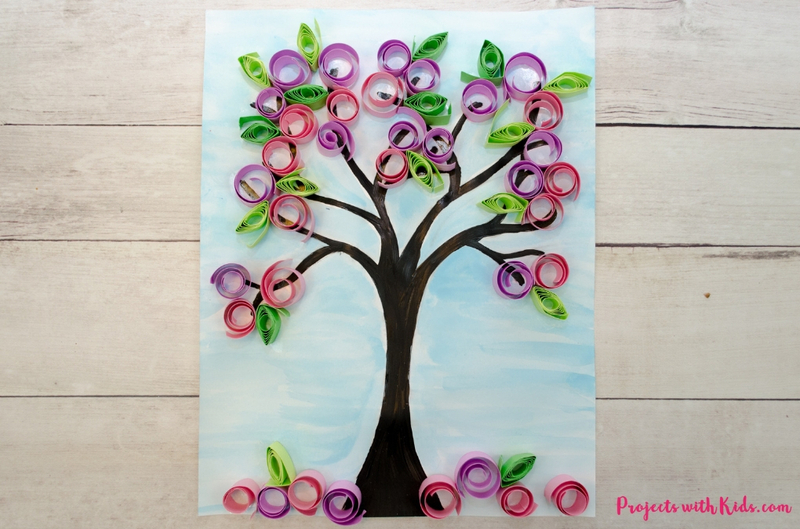 This is such a fun spring paper craft for kids to make that looks just stunning when finished! 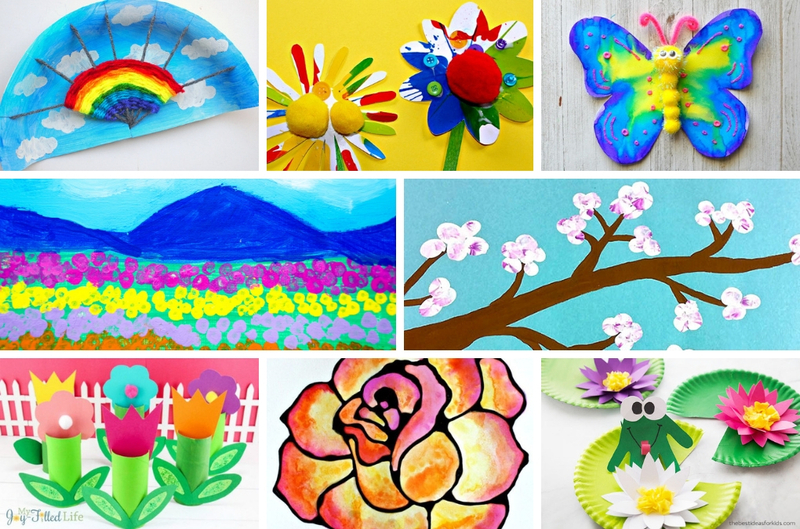 Kids will have fun creating their paper quills and designing their blossom tree.